The integration between Skype and the midrange high-definition videoconferencing system will allow many more people to participate in virtual meetings. LifeSize claims Passport will be the first room-based videoconferencing system that can work with Skype. But users will pay a price in quality for the convenience of linking up with Skype. All the participants will move to the lowest common denominator video quality, which falls short of HD. 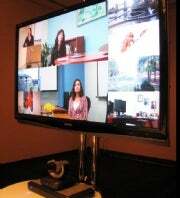 Logitech, the parent company of LifeSize, has a presence in both ends of the videoconferencing business. In addition to room-based systems such as Passport and the higher end LifeSize Room platform, it makes webcams priced under US$100. Making Passport systems work with Skype brings those worlds together. Because Skype also works on many PCs and mobile phones, and has a vast community of registered users, the new integration could also expand the pool of participants in video sessions. "For companies that have conference rooms deployed and people out on the road or in hotels, I think the ability to accept a Skype call when you need to accept a Skype call is a tremendous advantage," said Wainhouse Research analyst Andrew Davis. Davis believes LifeSize will be only the first of many vendors of room-based systems to integrate Skype. Davis also thinks Facebook, with a user base of more than 500 million, could be an attractive integration target for videoconferencing vendors. Skype users can join in on a Passport video session from any Skype client, or even initiate a call, according to Mary Miller, director of product marketing at LifeSize. With the software upgrade, Passport users will be able to log into their own Skype accounts and get access to their Skype buddy lists. They can search through the list and call a buddy with the Passport's remote. LifeSize has been working with Skype for about two years, since before the acquisition by Logitech, to make this happen, Miller said. Currently, Skype users can participate in Passport videoconferences via voice but not video. After the upgrade, they will still be able to join in voice-only mode if they prefer. When a Skype user joins a Passport session via video, the image size will not change, but the resolution will be different from a pure Passport-to-Passport session, Miller said. The effect will vary depending on how the call is set up. When all participants in a meeting are using a Passport system, the video can have a resolution as high as 720p (1280 by 720 pixels) at 30 frames per second. But if a Passport user brings a Skype user into a meeting, the maximum resolution for everyone will be 640 by 480 pixels, or standard-definition TV quality, also at 30 frames per second. If it is a Skype user who initiates the session, the best possible quality will be 640 by 480 pixels at 15 frames per second, Miller said. The limitation comes from incorporating the Skype service, Miller said. Even if two users both had Passport systems, and they called each other via Skype -- an unlikely scenario -- the maximum quality would be only 640 by 480, she said. However, many users will accept this loss of quality in order to bring more participants into a call, said Wainhouse's Davis. Consumers already cope with poor mobile call quality for convenience, he said. "What the last few years have shown ... is that people want the best quality, but they are very happy to live with less when other things come into play," Davis said. The software upgrade will come with version 4.8 of the Passport software, available for downloading free this month, and will come pre-installed in future systems. The Passport platform is designed for small and medium-sized companies. It includes a high-definition camera, a microphone and a codec device, for about $2,500. The Passport is designed for use ideally with an HD display of 42 inches to 50 inches, which the customer supplies.